The shipwrecked persons (20) are dispatched on the foredeck and in the wheelhouse where hot drinks, energy food, clothing and first aid covers can be supplied. In addition, a first-aid equipment is part of the outfits; it allows the crew to comfort the survivors, first relieve the suffering of patients and provide first life-saving care while awaiting a more substantial medical assistance. The fore deck and the wheelhouse allow to welcome seated or lying persons. A large diameter crosswise towing bitt enables towing a disabled or down vessel. Towing post with 5086 aluminum support. The trailer is stored on a hydraulic light alloy reel of 150m capacity. in Ø26mm., a mechanical rotation lock is adapted. Drum set behind the wheelhouse. The upper section of the stern railing is made up of a Ø60mm tube at the location of the carriage of the trailer. The traction of the lauch is adapted to 4T to tow, in bad weather conditions, ships of less than 500 gross tonnage and under 150 tons displacement. Fire-fighting is performed by two pumps. One fixed is driven by a motor (23m3 at 8 bar). The other removable, is driven by a heat engine. 1 water cannon Monitor GP3000 type with Johnson Pump is set on the fore part of the main deck. It allows, on a wide distance, a very effective intervention on a burning vessel. The rescue launch ORC 182 is fitted with a submersible pump 14000lit / h equipped with an intake of a handle with firefighter connection for drying compartments of ships in case of an ingress of water. The rescue launch ORC 182 complies with the French Regulations for cargo ships of less than 500 gross tonnage. - structure N.G.V standard. The launch is built according to French Maritime Regulations - 214-215-217-222-236 division and for « navigation » to « unrestricted » navigation. This « All-weather » rescue launch ORC 182 is provided for a heavy seas service with very high significant wave 2.50m to 4m (surges 6 - Douglas scale). This rescue launch is specifically designed for rescue operations on the North Sea EEZ area of Belgium. She can only be driven by experienced seafarers. Its crew consists of 3 to 6 seamen. The tasks listed above are completely fulfilled by the rescue boat ORC 182, thanks to its size enabling it to intervene very near the coast (small-draft), its maneuverability, its excellent seakeeping and its highly adaptive equipment. 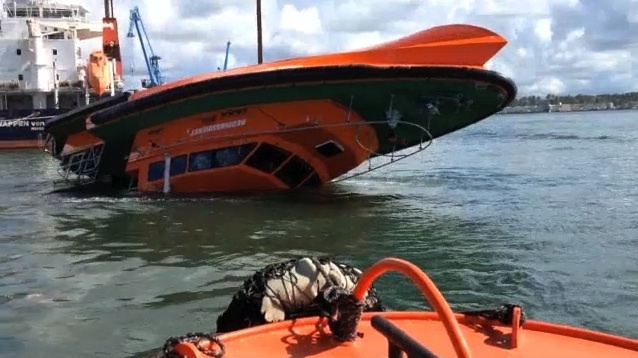 Besides its design to tackle the roughest seas, the lifeboat ORC 182 is self-righting in the event of an accidental capsizing due to very exceptional boating conditions. It is unsinkable, whatever one compartment flooded under deck. It retains in this position with a suitable buoyancy plate. Boarding shipwrecked persons is, in principle, be carried out from the back deck area. The boarding path is free of any sharp edges that could injure the shipwrecked when they hoist aboard the rescue boat. Optional : On the scene of a major disaster (eg. passenger evacuation on a ferry or on a landing of a plane) the rescue boat may have on its rear shelf of a rack containing two life rafts 100 seats droppable quickly (in this case, the load of this option might have been planned in the stability and autodressement specification file). Besides its design to tackle the roughest seas, the rescue launch ORC 182 is self-righting (as S.N.S.M. & PILOT) in the event of an accidental capsizing due to very exceptional boating conditions. This device ensures the protection of the crew, but does not allow engine start.